Straps for vintage fixed wire lug trench or officer's wristwatches. Longines; Ernest Francillon & Co.
IWC: the International Watch Co. The Fallacy of the "Maker's Mark"
Copyright © David Boettcher 2006 - 2019 all rights reserved. If you have any questions or comments, please don't hesitate to contact me via my Contact Me page. This photograph shows Type B and Type A straps in brandy and dark chestnut Italian leather, both with my hand made sterling silver buckles, on small samples of the hides, to give you a different view of the two colours. The brandy is the lighter of the two colours. These are beautiful Italian leathers that I have to import myself because they are not available from any leather supplier in the UK. They are premium leathers, the best I have ever seen. 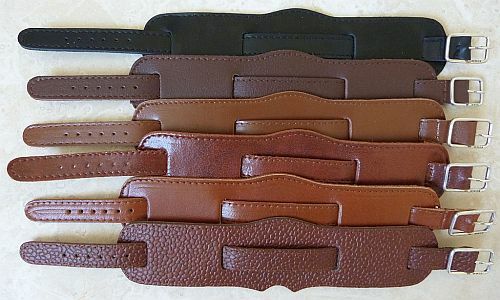 They are much more expensive than the standard leathers so I have to charge an extra £2.00 for straps made from these premium leathers. 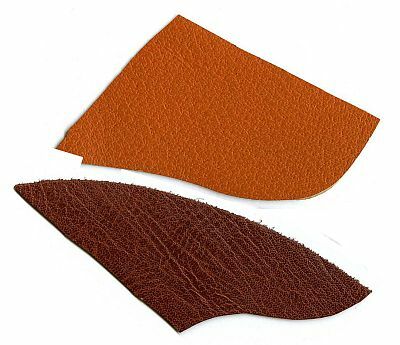 The colour can vary a little across each hide for all leathers, and it is always difficult to get a good colour representation on a computer monitor, but these are high quality Italian leathers with beautiful deep rich colours. I keep in stock straps made up in these two leathers with standard and Type GW sterling silver buckles, please see the ordering pages for details. For straps with Type GW sterling silver buckles: Sterling Silver and Nine Carat Gold Buckles. 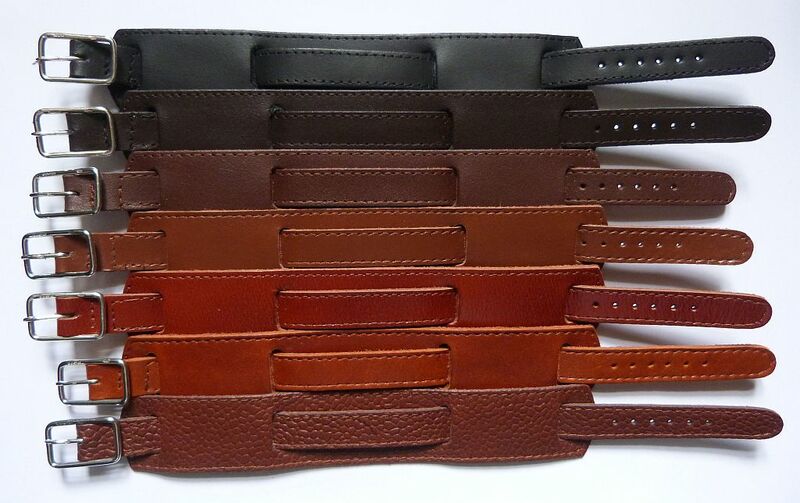 For straps with standard buckles: Straps with Standard Buckles. Straps that are not stock items can be made up on request, please see Special Orders. 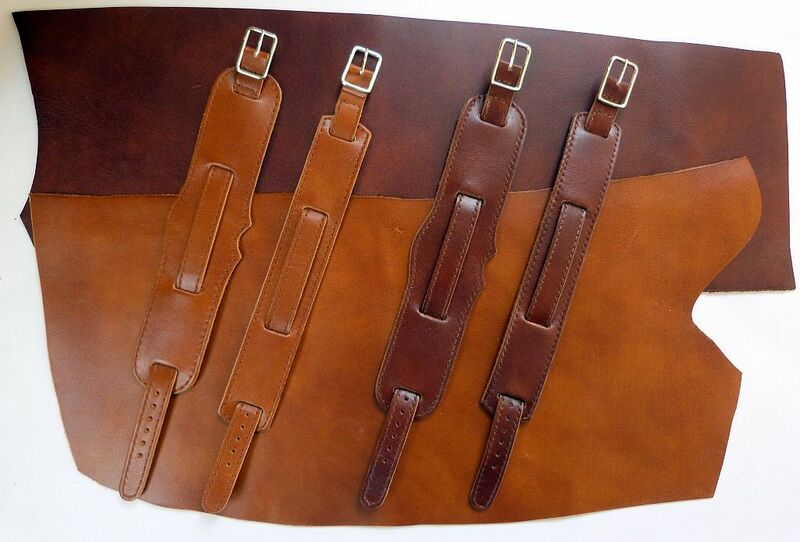 There are also pictures of straps made up in these leathers on the customers page. A leather with a nice grain pattern is Montana leather. 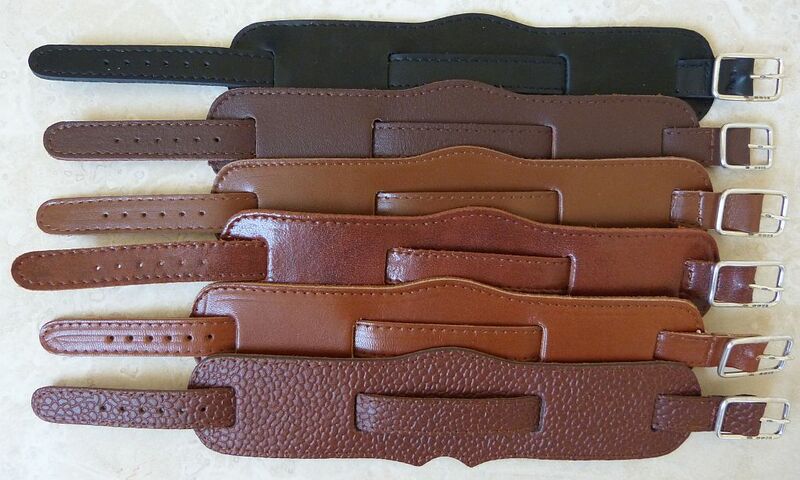 This is shown in tan in the pictures of alternative tan leathers below, but it looks different when made up as a strap and actually worn on the wrist. It's not a light tan colour, more of a mid brown. 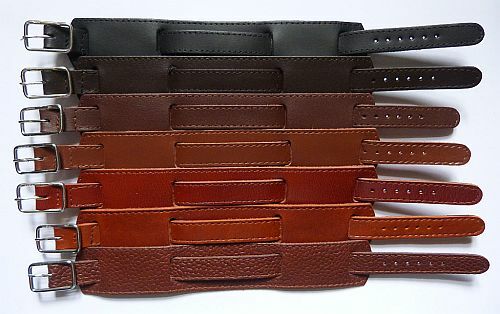 I do not keep straps in stock made up in Montana grain leather but they can be made up on request, please see Special Orders. The watch is a Borgel wristwatch with a centre seconds Lemania movement. The strap is a Type B in tan Montana leather. I have the Montana leather black, dark brown and tan. The tan is as pictured here, and in another picture in the next section below on alternative tan leathers. The dark brown is pictured below, I havn't picture the black because it is doesn't come out well in a photograph, it just looks black. The picture below shows a strap made up in a dark brown leather with Montana grain with one of my hand made and London hallmarked sterling silver buckles. bottom - Montana tan, which has a subtle grain. I do not keep straps in stock made up in these leathers but they can be made up on request, please see Special Orders. 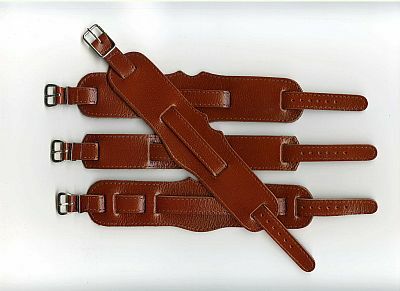 This picture shows some straps made up in chestnut. It is very difficult to get this colour to reproduce accurately, but if you think of the colour of a freshly opened conker you will be very close. The chestnut leather is quite shiny, but it is a very nice colour. Type A with Great War sterling silver buckles. Click image to enlarge. The picture to the right shows some of my Great War sterling silver buckles made up into Type A straps, and some of the available leather colours. If you click on the picture you will get an enlarged image. The colour varies across each hide, and it is always difficult to get a good colour representation on a computer monitor, so please take these picture as guides rather than absolute colour references. Type B with Great War sterling silver buckles. Click image to enlarge. The picture to the right shows some of my Great War sterling silver buckles made up into Type B straps, and some of the available leather colours. When we ran out of the old printing of tan morocco I found that the company we got that from has gone out of business. We managed to find another company which could print up some tan morocco for us, but you will notice that the morocco pebbling is slightly larger than that pictured elsewhere on the web site. I hope you like it, I think it rather more authentic than the previous version. 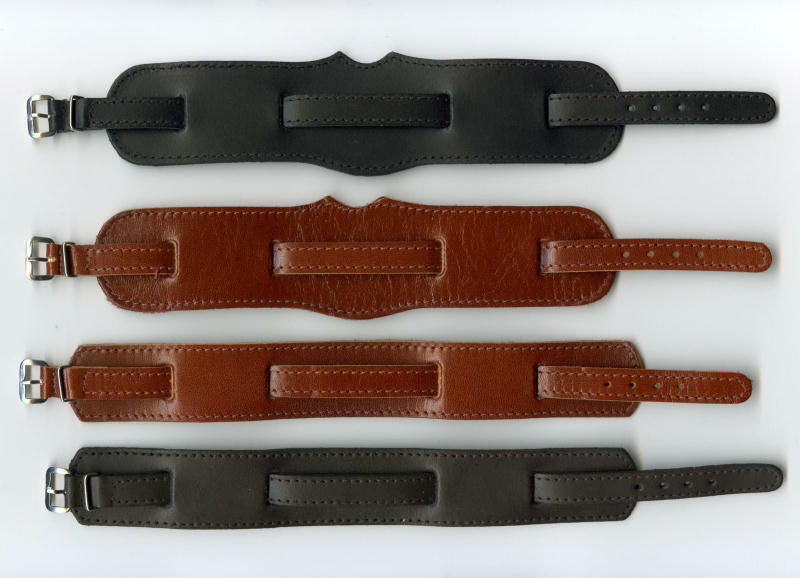 This picture shows the two basic designs of my watch straps - The broader Type B with the notch for the winding crown at the top in black and chestnut, and the narrower Type A at the bottom in chestnut and dark brown. 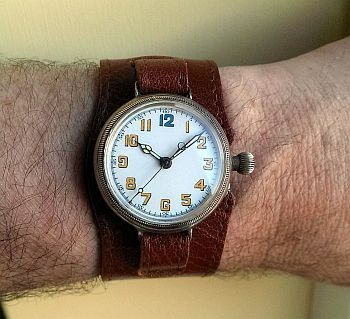 For full details of my designs, see the page with details of my vintage watch strap designs. If you have any questions or comments, please don't hesitate to contact me via my Contact Me page. Back to the top of the page. Copyright © David Boettcher 2006 - 2019 all rights reserved. This page updated January 2019. W3CMVS.